How to boil water ~ Yes, more please! In this section, you will find tutorials, methods, and cooking techniques that will help you accomplish more efficiently the recipes on this blog. I hope these tricks and how-tos give you more confidence and help you brush your skills in the kitchen. Now, why not choosing the easy way a can?… For me is all about flavor; and if we talk about other facts like cost and yield, roasting your pumpkin at home will always be the best option. What about time? It takes about one hour and fifteen minutes from beginning to end. The reward?…you will have an arsenal of delicious, no metal flavor, no artificial additives, all natural roasted pumpkin in your freezer. Can you apply this method to any of the other pumpkins and squashes out there? Definitely yes!, just adjust the cooking time for smaller squashes like, butternut squash, and acorn squash, they might need around 25-35 minutes. I love to buy 2 or 3 small size pumpkins, because I find them easier to handle and very meaty. The yield I usually get from them is about 4-5 cups per pumpkin. I freeze the puree in small flat batches using freezer bags, so it is so easy and fast to defrost when cooking time comes. I hope this helps you and encourage to roast a pumpkin. 1. Wipe the outside of your pumpkins with a damp towel. Cut in half, length wise always cut away from your hand, like in the picture below. 3. Preheat the oven at 450F. Line a baking tray with aluminum foil, or parchment paper. 4. Place the pumpkin halves upside down, and bake at 425F for 45 to 60 minutes, or until they feel soft when a knife is inserted. 5. Once they are done, remove from oven let them cool for 15-20 minutes, and start to scrape the pulp . place it into a bowl or a food processor . Puree until smooth. 6. Once the puree has cool down, measure and place it on freezer bags. Keep in mind that by flattening your bags and freezing them flat will reduce the defrost time . 7. 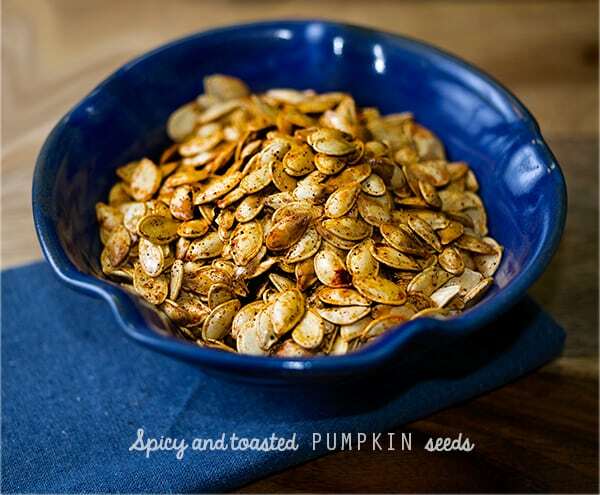 If you save the seeds, rinse them, until no fibers are attached to them, path them dry, spread them on a baking sheet, and toss them with some grape seed oil or olive oil, se salt, chili powder , paprika, and spread them into one layer on a baking sheet. Bake for 30 minutes at 325 F / 160 C and toss every 10 minutes with a wooden spatula. Pull them out of the oven let them cool for a bit and enjoy a healthy almost free snack!